People of all ages make mistakes when it comes to their money. We don’t save enough, we buy things that we can’t really afford, we don’t plan enough for emergencies, and more. There are some common money mistakes that are known to be made at certain stages of life, and it is wise to avoid them as you go along. For example, people in their 20’s often don’t earn enough to afford expensive cars and vacations, yet they take them anyway. In their 30’s, it’s not uncommon for people to combine all of their money with their partner, which can lead to disaster in the case of a break up. People in their 40’s and 50’s should be building up their retirement savings, but many are not. Instead, they are spending money on their children’s college tuitions and co-signing on loans with them. By the time they reach their 60’s, their money mistakes may make it difficult for them to be able to pay for medical expenses that occur. 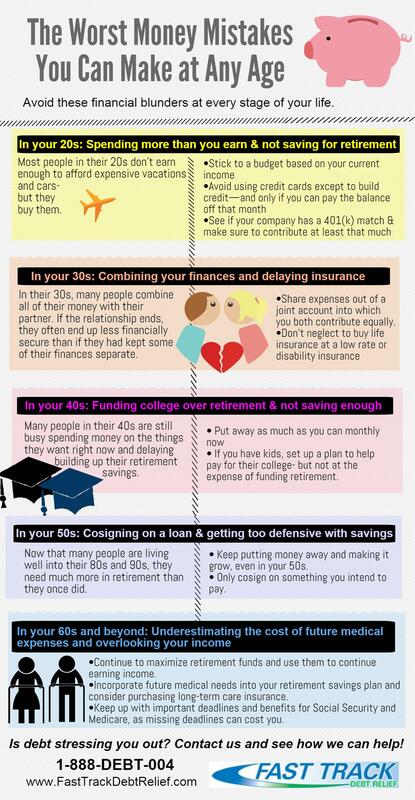 Our infographic below outlines the worst money mistakes you can make at any age, and provides tips on ways to avoid making these mistakes. Whether you are 20 years old, 60 years old, or anywhere in between, there is something relevant to you. As one of the leading debt relief companies, we help our clients by providing comprehensive debt settlement programs to settle your qualified debt for a fraction of what you currently owe. If debt is stressing you out, or you feel that you are making any of these money mistakes, feel free to contact us today. We will be happy to answer your questions and provide you with a free quote on how we can help with debt relief.